Image courtesy of WKTLA. Demolition crews brought down a portion of a famed downtown Los Angeles bridge sooner than expected. LOS ANGELES (AP) Demolition crews brought down a portion of a famed downtown Los Angeles bridge sooner than expected, allowing for the early reopening of a section of U.S. 101 that was closed for much of the weekend of Feb. 5 to 7. Traffic began flowing again on the freeway shortly after 10 a.m. Feb. 7 — about four hours ahead of schedule, said Mary Nemick of the city Public Works Department. A 2.5-mi. (4 km) section of the freeway was closed so crews could bring down 220 ft. (67 m) of the 6th Street Bridge. No major traffic tie-ups were reported. The freeway closure was dubbed the “#101 slowjam” on Twitter, and city officials embraced the odd branding as a way to get the word out to motorists to avoid the area for up to 40 hours. “Sometimes, just sometimes, you have to get your hands dirty to build somethin' beautiful,” Mayor Eric Garcetti crooned in a public service spot. 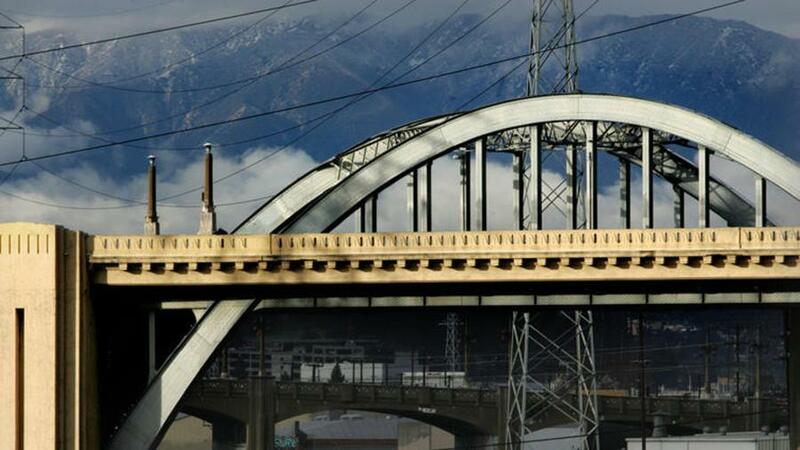 “While it is in many ways bittersweet to see the dismantling begin of the historic 6th Street Bridge, it is also symbolic of a new history that is emerging at that site,” said Councilmember Jose Huizar, whose district includes the span. Eventually, the entire 3,500-ft. (1,067 m) bridge will be replaced by a new roadway that has the potential to become another Hollywood backdrop. A 2019 opening has been set for the $449 million project.